The first National Book Store was destroyed by a major fire, the second, by a typhoon, but nothing would stop its resilient founders. While we all have fond memories of childhood trips to National Book Store, no one can tell its story better than Nanay Coring, its co-founder. On its 75th birthday, we take a look back at its history, the challenges it has faced, and ultimately, its triumph, with Nanay Coring as our guide. 1. The owners, Soccoro Cancio and Jose Ramos, met at a bookstore. 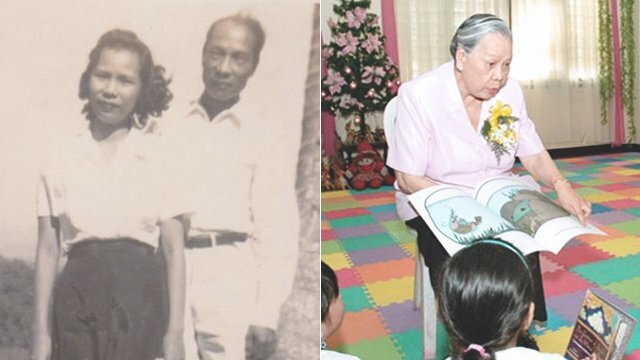 "Nanay Coring," as she is lovingly called by family and National Book Store's employees and partners, had just finished high school when she met her future husband, "Tatay" Jose Ramos. She was working at her brother's bookstore, which was called Goodwill Bookstore. Tatay was the brother of Nanay's sister-in-law. Tatay would visit his sister and that was where he met Nanay. In An Open Book: Thursdays with Nanay Coring, authored by Nanay's only daughter, Cecilia Ramos Licauco with Yvette Fernandez, Nanay describes their love story as a simple one. "Tindera ako. Bookkeeper siya. Nagkakilala kami," she shares. She was only 18 years old when they wed, while he was 14 years her senior. 2. They named the store after their cash register. After the wedding, Nanay took the knowledge she had gained from her work with her brother's bookstore and the couple opened their very first store—a small shop at the foot of the Escolta Bridge. They didn't know what to call it, so they named it after the brand of their cash register. 3. The first National Book Store was devastated by a fire, and the second one, a typhoon. During the war, a fire broke out in Escolta and it burned down the store. The Ramoses rebuilt the bookstore on a smaller lot at the corner of Avenida and Soler. It rose again just in time for the first school year after the war, and became the go-to place for textbooks and school supplies. In 1948, three years later, a typhoon wreaked havoc upon the store and its stocks were damaged but the couple rebuilt the store, only the next time it was at a two-story shop in Avenida. 4. As their family grew, the business grew. IMAGE National Book Store, Tatay Jose and Nanay Coring with their children Fred, Ben, and Cecilia. The Ramoses were soon a family of five after welcoming three children: Fred, Ben, and Cecilia, who later entered the family business with their children. The business flourished and more branches were opened. Later on, when Coring was left to manage the store with her children, they all met on Thursday afternoons for National Book Store management committee meetings. 5. At one point, Nanay Coring produced her own postcards and greeting cards. Before partnering with Hallmark and distributing other international brands, Nanay Coring produced her own material, such as greeting cards and postcards. She hired photographers to travel locally and take photos of landmarks and people in traditional costume. These were the images that appeared on her postcards. 6. To woo Hallmark's executive, Nanay Coring welcomed him at the airport without a set meeting. Hallmark executive Bob Frasier was set to visit the Philippines to look for a local licensee. He had set meetings with the much bigger bookstores, leaving out National, which was considered too small at the time. To get an appointment, Nanay Coring waited for Frasier at the airport with a sign of his name in hand. When they met, she took him to his hotel and bagged his first appointment slot for the next day. She took him to the bookstore and wowed him with her greeting cards. "He was very impressed," she tells the authors of An Open Book, "He asked me to show him a business plan. I said I had none. He asked me to make one. I said I didn't know how. So he just started asking me questions. What my plans were. How could I sell his cards. We just sat down and talked face to face." It was clear to Nanay Coring that Frasier had already made up his mind. National Book Store has sustained that relationship with Hallmark for over 40 years now. 7. National Book Store has brought many international best-selling authors to visit the Philippines. IMAGE National Book Store, Author Mitch Albom signs a book for Nanay Coring. IMAGE National Book Store, Amy Tan at the first ever Philippine Literary Festival. Going beyond just dealing with books and supplies, National Book Store has set up book conversations and signings and has flown in international bestselling authors to inspire and nurture a new generation of readers. A recent addition to its roster of events is the annual Philippine Writers and Readers Festival, which invites readers and writers to panel discussions and talks. 8. While National Book Store has amassed remarkable success, it always aspires to give back. IMAGE National Book Store, Nanay Coring reads to school children. With over 220 branches, 4,000 employees, and 1.5 million customers a week, the business continues to root itself in humility and goodness. Through avenues such as the National Book Store Foundation, the bookstore engages with impoverished communities to provide its poorest schools with libraries and supplies. "Happiness is helping people," Nanay Coring has always said. 9. On its 75th year, National Book Store continues to surprise us with concepts such as Art Bar, Workstation, and Noteworthy. The business continues to cater to the younger generation and has embraced the digital age. In the later store prototypes, which Managing Director Xandra Ramos-Padilla tackles in the epilogue of An Open Book, Art Bar, Workstation, Noteworthy, and Kids Ink all still adhere to the lessons and value that Nanay Coring and Tatay Jose started National Book Store with. IMAGE COURTESY OF NATIONAL BOOKSTORE, The management of National Book Store. IMAGE COURTESY OF NATIONAL BOOKSTORE, Piolo Pascual serenades Nanay Coring during the 75th anniversary celebration of National Book Store. An Open Book: Thursdays with Nanay Coring, by Cecilia Ramos Licauco with Yvette Fernandez, is available at National Book Store.